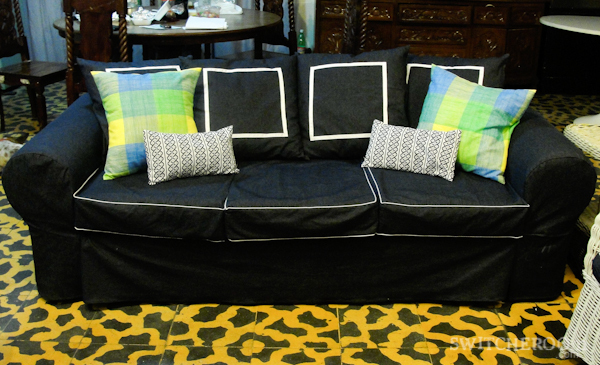 Decor me Happy by Elle Uy: Our couch is wearing denim! 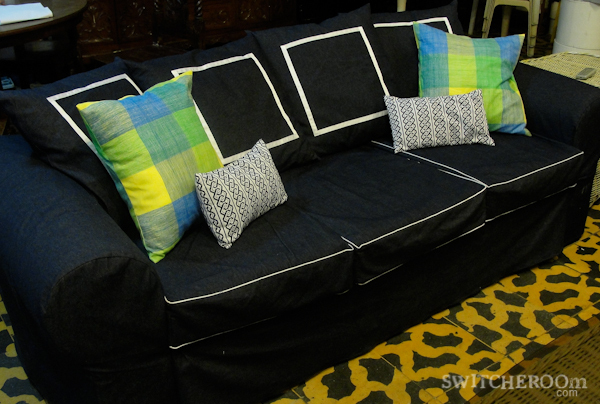 Our couch is wearing denim! 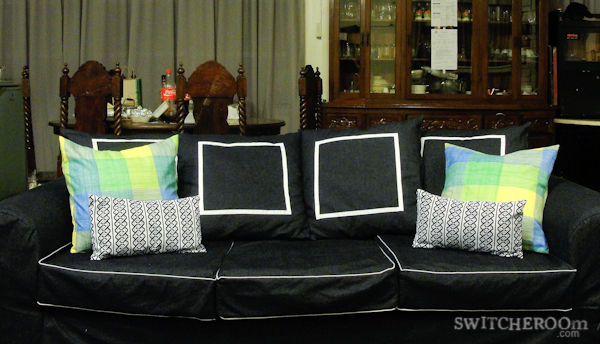 You've seen a little sneak peek of the new denim wear for our living room seating here. But that's just a little complement to the real deal -a denim couch. This couch is fine, comfy and has a nice shape, but I hate the color! Of course I wouldn't take any credit for sewing this thing up, our house help, Yaya Tas, made this! She don't have much experience in doing slip covers, her forte is tailoring pants. But I guess if you know how to sew, all you need is a tape measure, some common sense, and a whole lot of patience to whip up something like this. I love how the throw pillow has all the fun colors of the living room -blue, lime, and yellow. That's one good looking couch if I can say so myself. Next on the list are those brown stuff in the background -dining table and chairs. I'm not even thinking about that china cabinet, I'm scared. This is way too cute! I love it! You have a great sense of interior design. I just got a free couch on craigslist and it needs a little face lift. 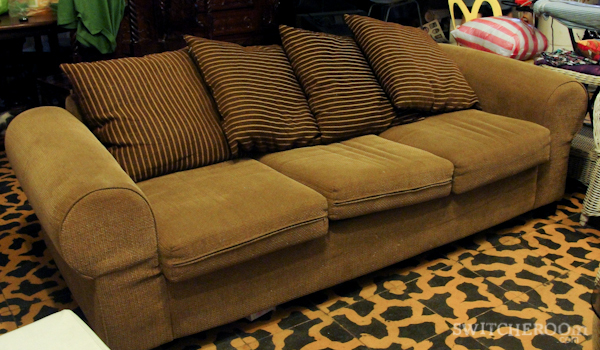 I can't wait to post it :) Ive been checkin out other peoples couch re-dos. MUCH better. I am jealous that you have someone who can sew for you! Fabulous! Will it wear blue dye off on your clothes when you sit on it though? I have that problem with my dark denim jeans. LOVE it. Great job. You are so lucky to have such amazing help. The piping really adds to the design, Ilike it! - as for the sewing - WOW! I slipcovered a few chairs this year, and I have a new respect for the amount of talent this requires! I love the new look of the couch! It's such a fresh change from the old look haha! I love the dressed up couch its gorgeous, your truly amazing girl! 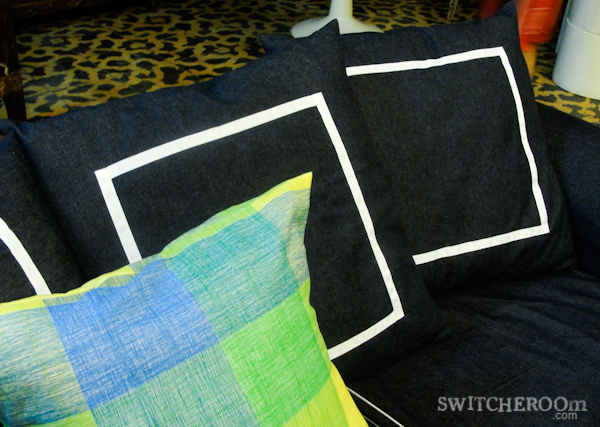 Love the playful and contrasting pillow cases. BTW the tiles rock. Now THAT'S what I call a transformation :0) Gorgeous! Thank you! I know I'm really lucky to have someone who can sew for us, or else half the transformations here wouldn't even be possible! My favorite AT house tour to date!